Energy efficiency, a low PUE and precise temperature control are always high priority for specifying coolers for new and refurbished data centres. But what about the forgotten criteria for best practice cooler specification; water consumption and Legionella control? Water Usage Effectiveness (WUE) offers impressive OPEX benefits and convenient control of Legionella which are underestimated within the Data Centre specification arena. Let’s examine both topics in more detail. As a general rule hybrid cooling plant uses evaporative cooling methods for around 50% of the year, only switching to dry mode in temperatures lower than 9.6°C, most commonly between January and April and then again in November and December. Meaning such technology relies heavily on the consumption of water in order to deliver effective cooling results. Adiabatic technology can work efficiently in dry cooling mode for 97% of the year when operating in colder climates like the UK – only switching to evaporative cooling when temperatures exceed 21-23°C, which in mission critical environments that work around the clock equates to a tiny 3% of the year. Given this advanced dry cooling capability, it should be no surprise that adiabatic coolers consume approximately 2% of the water used by wetted surface hybrid dry coolers. Even when operating in wet mode, adiabatic systems automatically employ a pulsed spray operation to minimise water usage delivering much improved Water Usage Effectiveness (WUE). If we examine those figures more closely, as water consumed in cubic meters over a one-year period for a 1000kW unit, an adiabatic cooler consumes 92m³of water, compared to a hybrid cooler which requires 8,647m³ and a conventional cooling tower which is more in the region of a staggering 28,032m³. Energy consumption is, of course, a key driver in design. 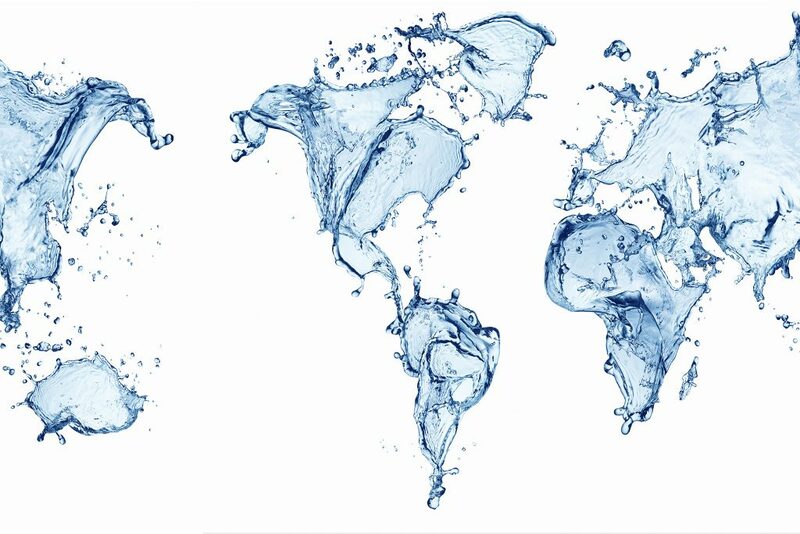 However, water is a natural resource and when adiabatic coolers can offer the same low energy consumption but with the reduction of between 8.5M and 28M litres of water per 1MW of cooling/annum at a cost saving of between £19k and £62k per 1MW of cooling/annum the efficient use of water should be considered by all involved. Cooling equipment which stores water or has a heat exchange surface which is directly wetted is notifiable to the local authority under the ‘Notification of Cooling Towers and Evaporative Condensers Regulations 1992’ act. When comparing the most popular cooling technologies for the data centre market, the only one exempt from this admin-intensive registration process is adiabatic cooling equipment like Transtherm’s HSE approved, noise reducing range of adiabatic technologies. It is important to note that the adiabatic technology marketplace varies greatly in equipment quality and performance; specifiers should confirm with their manufacturer of choice that the plant they are purchasing is indeed exempt. Let’s look at class-leading adiabatic technology, for example, which inherently prevents the production and transmission of Legionella through a pre-commissioned UV system fitted as standard. Whilst it is imperative to ensure that the mains water feed supplied to an adiabatic system is clean and free from contamination, an integral UV system is extremely effective at killing Legionella (99.99+%). By administering a 30ml/cm2 UV dosage at the end of a lamp’s life, the system can be categorised as 99.999% effective at killing Legionella assuming that the water has a UV transmission of more than 95% in a 10mm cell at 254nm. Harnessing the power of technically advanced industrial controls, market-leading adiabatic coolers will also automatically operate a number of UV system fail-safes to further protect environments such as hospitals from dangerous nosocomial outbreaks. These fail-safes typically include raising alarms via remote monitoring systems in the event of a UV failure. Remember, these systems have a trigger point of around 23°C which means the adiabatic spraying function is only in operation around 3% of the year. 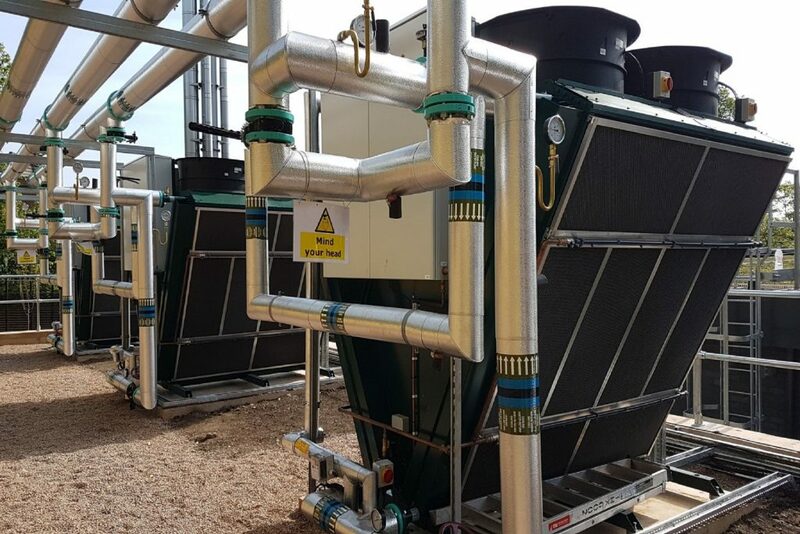 With long periods of inactivity, these fail-safe modes are vital to ensure that the correct UV treatment is administered in the warmest months of the year, when the plant is operating at temperatures which are most conducive to the cultivation of Legionella. Should the UV system not respond adequately when wet mode is triggered, the controls will either switch off the adiabatic system pending repair, or switch to a standby UV system if one has been installed. Either way, the alarm is raised through the centralised remote monitoring system so that adequate manual intervention or maintenance can be arranged. 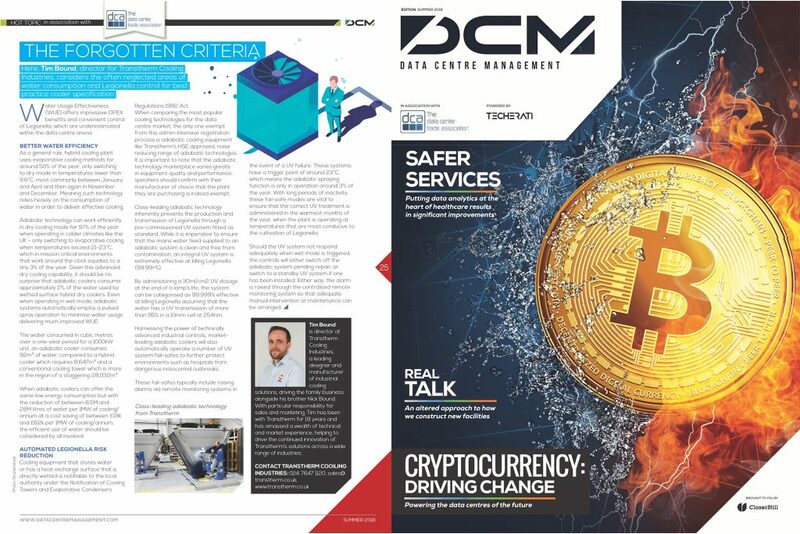 This article was featured in the Summer 2018 issue of Data Centre Management, within the Data Centre Alliance ‘hot topic’ panel. 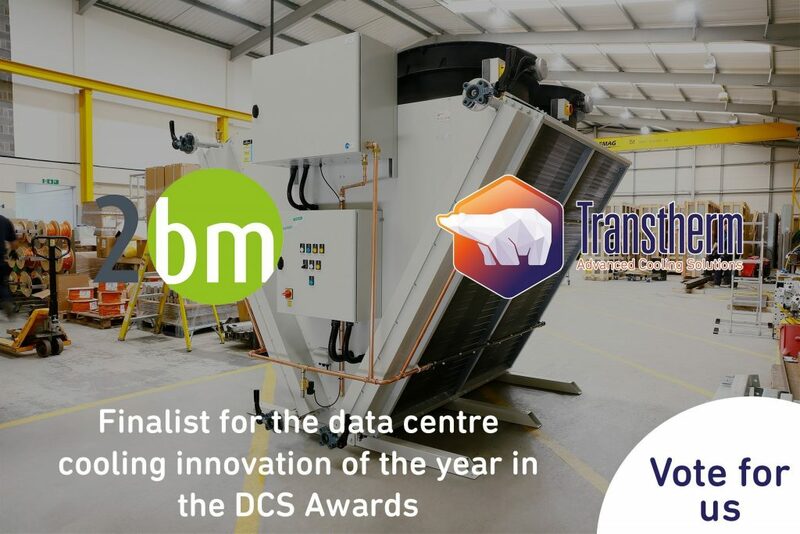 Discover the Transtherm product range here, or call our team on +44 (0)24 7647 1120 to discuss your next data centre project.